I have been eyeing this hike for years. As I swap stories with hikers who I meet on the trail, it seems that they've all done the Bridge to Nowhere. 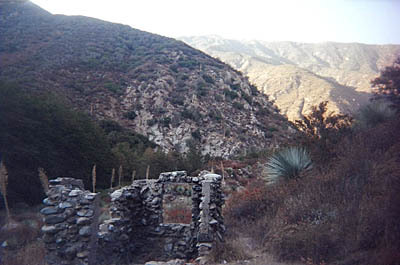 This hike is extensively covered in the literature and has been heralded as one of the most popular hikes in the San Gabriels. 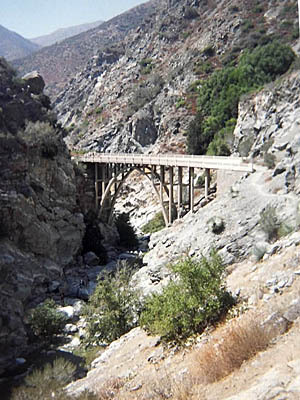 Jerry Schad declares, "The trek to the old bridge is in the same league as the climb up Old Baldyan obligatory experience for L.A.-area hikers." So finally I decided it was time for me to enter this rite of passage and hike to the famous bridge. I connected with my friend, Albert, we set a day, and off we went. One of the reasons I had been avoiding the hike over the years is because of all the crowds reported to be flocking there. To quote Schad again, "On warm summer weekends, hundreds of people walk the trail going up from East Fork Station." Quite frankly, I'd rather hike where I have more solitude. So my plan has been to hike it on a weekday. However, year after year passed without being able to coordinate a weekday with a hiking partner in right season. So finally I just said heck with it and decided to join the masses of humanity on a Saturday. 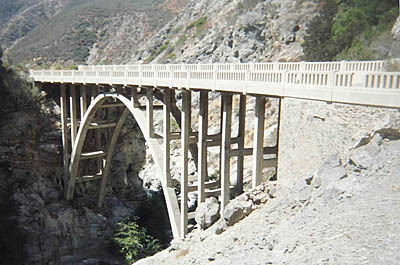 I tend to favor hikes to mountain peaks, but it seemed that the famous bridge was a worthy destination. And this hike certainly proved that to be true. It was a great way to spend a day. The following is a running account of our adventure. If you'd like to hike it, I'd suggest looking at some of the hike descriptions available (links below). 5:04AM - Alarm went off. 5:53 - Albert arrived. I finished packing and off we went. We drove up Hwy 39, turned east on East Fork Road, and drove to the parking lot at the East Fork Ranger Station, about 18 miles from our homes in Azusa. We had hoped by getting an early start, we'd beat much of the crowds. There were 12 cars in the lot. 6:55 - Started hike, heading past the locked gate and up the dirt road. After a couple minutes we stopped at the Sheep Mountain Wilderness entrance sign. Albert posed for a photo. A solo hiker passed us by; he was on his way to the bridge. 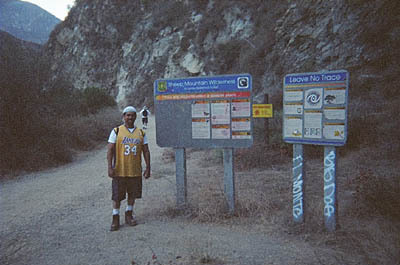 7:07 - Heaton Flats Trail junction (8W16) - 0.5 mile. One party was camping in the campground. 7:18 - First river crossing. My biggest concern for the hike was the numerous water crossings. Quite simply, I've never been hiking 10 miles with soggy feet. So my plan was to wear my good hiking boots and skillfully find stepping stones, avoiding getting my feet wet. For the first crossing I was successful. This won't be bad, I thought. 7:23 (est.) - Second stream crossing. This time my right boot got pretty wet. To my surprise, my "waterproof" boots aren't that waterproof. We lost the main trail, which we found throughout the daytypical for much of the route. 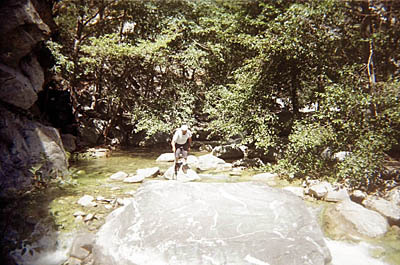 The "trail" crossed the river many times, making it hard to know which is the best route. 7:37 - Third river crossing. I fell in. Feet soggy now. 7:46 - Bridge pilings, remnants of the road that was washed out in 1939. 7:51 - River crossing to the left (red arrows on rocks). 8:04 / 8:19 - Stopped at where the river bends right (east). We can see the use trail at the end of Shoemaker Road, several hundred feet above us to the north. Talked with a couple prospectors who where on there way up to their spot. They gave us some helpful trail tips. They called that location "Fish Rock." 8:48 (est.) - Two young men with overnight packs passed us by, heading to the Narrows Trial Camp for the night. 8:45 - Photo looking back west, me, looking back west. Saw a garter snake (about 24 inches). 8:58 - Two young women backpackers passed us by on their way up to the Narrows Trail Camp for the night. 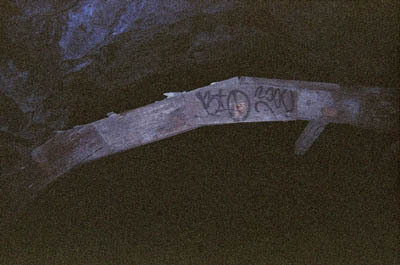 9:07 - Crossed new wood footbridge (stamped USFS 2003), after rounding the bend as the trail follows the river north. 9:10 / 9:14 - First view of Swan Rock. Pretty neat. We let the girls and the scouts pass us by. 9:30 - River crossing back to the left bank (east). John Robinson cites four river crossings. I lost count by this point, but we've crossed far more than four times. 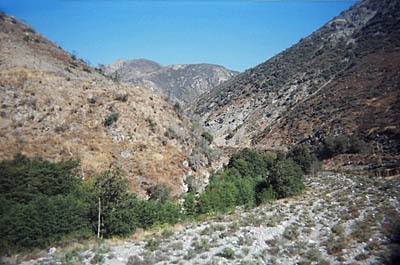 Emerging from the riverbed, there was a huge oak tree next to the trail on the left. 9:50 (est) - Photo northwest up canyon from the high roadbed. 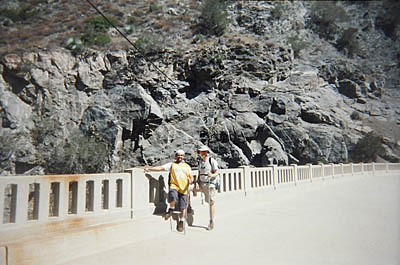 Two male hikers were coming down the rail, well below on the canyon floor. We wondered if we missed the trail or did they. 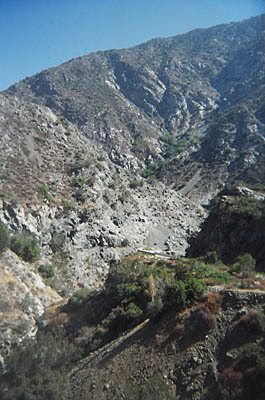 After a couple hundred more feet up the trail, the roadbed abruptly ends and the route drops precariously down the steep slope back to the riverbed, re-joining the main trail. Seemed like a senseless sidetrack (on the return trip we found that this route was a way to avoid two river crossings). 10:09 - Switchback to right from the canyon floor to the roadbed on the right (east) bank. This is the trail feature which I thought we negotiated at 9:50. 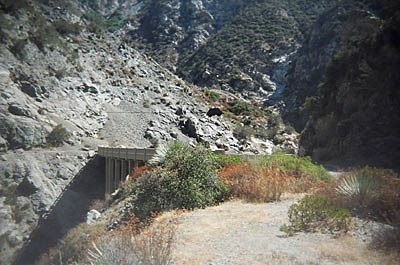 Jerry Schad describes it this way: "At 3.5 miles, the trail swings abruptly right and climbs about 60 feet to meet a remnant of the old highway. The old roadbed carves its way along the east canyon wall, high above what is now a wide, boulder-filled flood plain laced with the meandering, alder-lined stream." What would be helpful to mention is that after the sharp right and short climb to the roadbed (2 minutes), you take a sharp left up canyon, north. Making the transition to the roadbed is important. I've heard accounts of those who missed it and proceeded up the canyon floor only to hit a dead end a half mile later, with no way up the steep canyon wall to the trail high above. 10:28 - Gap. Photo northeast. By now we've rounded the bend to the northeast as the canyon narrows. 10:36 (est) - Private property boundary sign. 10:49 - Photo east toward the bridge from a small cinder block storage building. 10:52 - Bridge to Nowhere. We've arrived. After 4.7 miles of numerous river crossings, scrambling up and around boulders, losing and finding the trail, scorching sun, scratchy brush, and poor trail tread, we've finally arrived. We also experienced some splendid scenery, the pleasant sounds of rushing water, the pleasing scents of sage, and the sense of adventure. The bridge is in fine condition and a worthy destination. The views from the bridge to the gorge below are particularly striking. I was surprised that when we arrived at the bridge. There was no one there! Where's the crowds? I took some photos (Photo from the west end of bridge). After about 10 minutes a young couple arrived. We chatted and they took our photo for us. They headed up the trail. We sat on a couple rocks in the cool shade of the hillside and ate lunch. I took off my wet footwear and let my feet dry and de-wrinkle. A party of three older men arrived. They laughed when I said I was collecting tolls to cross the bridge. They continued up stream, without paying my fee. A few minutes later, the two girl backpackers arrived. We thought they were long ahead of us, but they got lost (and to think, earlier I had followed them across the river, thinking they knew the way since they had hiked the trail before). And in a few more minutes, a party of three middle-aged men came across the bridge heading back. They told us about the "cave" around the bend. 9-13-03 Looking west toward the Bridge to Nowhere.Large photo. 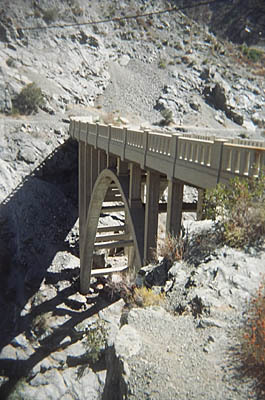 Note that this classic view is seen after you cross the bridge. What you see when you first approach the bridge is much less dramatic. Large photo. 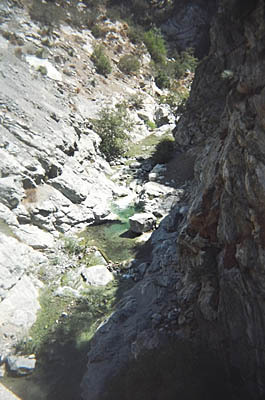 12:00 PM - Left the bridge and continued on the trail upstream, high above the deep canyon. There are a couple bad places on the trail within the first 200 yards past the bridge requiring diligent caution in negotiating. The consequences of a misstep could be serious. Some people were playing in the water near the bridge, well below us. 12:12 (est) - Saw and heard the backpackers at the Narrows Trail Camp in the canyon below. 12:16 - After we rounded the bend, we took a short spur trail (100 feet) up to the left and arrived at the "cave." Actually, it is the northeast end of the tunnel that would have started at the northeast end of the bridge, cutting a route through solid rock. The mouth had been filled in with rock except for the small opening we crawled through. We didn't venture more then 10 or 12 feet beyond the opening, using my little flashlight to dimly get a glimpse of the expansive interior and huge timbers. 12:25 - Left the tunnel and headed up stream. 12:30 - Trail meets the river. I had changed into dry socks and tennis shoes at the bridge, so I did not particularly want to get them wet until I needed to on the return trip. So Albert crossed the water and explored up stream another 5 minutes. I relaxed next to a sparkling pool. When Albert returned we cooled off in the water (yes, I took off my footwear). 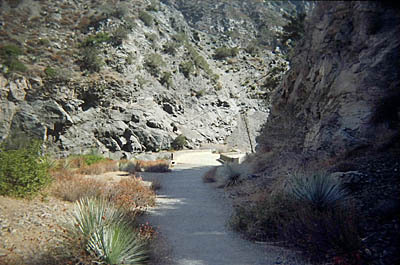 1:45 - 5-mile marker next to the spur trail to the tunnel. We hadn't noticed it before. 1:48 (est) - Passed a young couple coming up the trail. 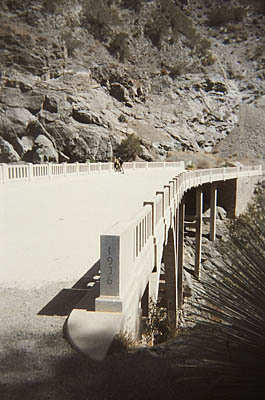 1:51 (est) - Photo (west ) of bridge. 1:56 - Back at the Bridge to Nowhere. There was a group of about 20 from the Santa Monica Coast Walk. They had us take a group photo of them, with about 8 cameras. Minutes earlier they had seen about 10 to 12 bighorn sheep down in the canyon at the water, downstream from the bridge, and a lone female bighorn on the south slope above. Albert and I wandered over near the cinder block hut to see if we could see the sheep. No sign of them. 2:30 - Left cinder block hut. 2:33 - Private Property boundary. 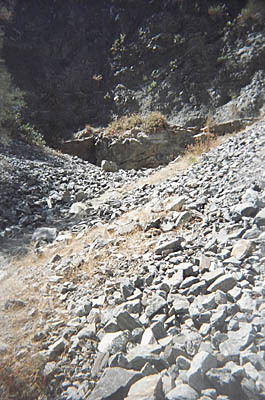 2:50 - Creek bed (10:09 location). 3:04 - River crossing. Rather than climbing up the east bank as we did earlier (9:57), we followed the main path. It necessitated two stream crossings. Thus, the high route avoided these crossings. Took off my socks. 3:07 - River crossing, back to the left (east). 3:23 / 3:32 - Reached big oak tree (9:30 location). Met a young couplethey were going up a ways. Chatted a few minutes. They saw a lone bighorn sheep a few minutes earlier. 3:49 (est) - Swan Rock. 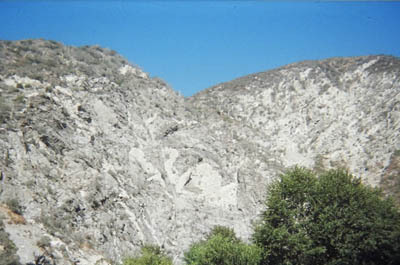 Actually Swan Rock is visible from the trial for 5 to 7 minutes of hiking. 3:47 - Wooden foot bridge. 4:20 - River crossing. I did not note the time of this crossing on the trip in. 4:26 - Beautiful pool. Sat on a log in the river. The cool water feels nice on the feet. Photo of me. Lingered for a few minutes. 4:44 / 5:06 - "Fish Rock" (at the bend). Snacked on some trail mix. Aired out wet feet. I put on dry socks, even though I knew they would get wet from several more crossings, I figured they'd give my feet some extra padding and help reduced some of the irritation from sand that gets into the shoes while wadding through the river. 5:15 / 5:24 - Stone hut ruins on the east bank (near the river crossing marked by the bridge pilings on the west bank7:46 location). We didn't notice the hut on the trip up. Saw a tarantula. 5:24 - River crossing. A young couple passed us heading down. After this we lost the trail and made some river crossings that we did not recognize from the up trip. But at his point, river crossings are welcomethe water is so refreshing. 5:54 (est.) - Past some bridge pilings which we did not see earlier (on the west bank). Evidently we lost the main trail. 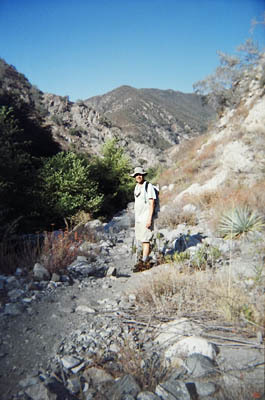 But I knew we were close to Heaton Flats Campground because I recognized the canyon that the trail follows, heading up to the east. 5:58 - Heaton Flats Trailhead. One party of about four was setting up camp. There also was a family of about five walking through the camp. The dirt road for the next half mile was welcome relief from not-so-good foot path we had been hiking on for miles. 6:15 - TrailheadEleven hours and 20 minutes later, we're finished! I did not bother to count the cars in the lot, but there were maybe 15 to 20. It was a long day and we were tired, but had a sense of satisfaction of having completed the trek to the Bridge to Nowhere. 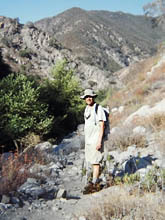 Time: Jerry Schad rates this hike as 4 1/2 hours round trip. - "...a leisurely half-day's round trip-hike." It took us about 4 hours to the bridge and about 4 hours from the bridge back. Grant it, we we're going at a leisurely pace and took a few breaks along the way, however, Schad's numbers seem pretty idealistic. You'd have to average a steady 2 miles an hours to complete this near 10-mile trek in 5 hoursnot realistic on this trail, and certainly not leisurely. This "trail" is just too rustic for a fast trippoor tread and vague route in many places, numerous river crossings, scrambling over boulders, scratchy brush. Getting wet: Just face the fact that a hike to the Bridge to Nowhere is an aquatic sport. You're going to have to wade through water ankle to knee deep on numerous occasions. I had hoped that by going late in the season when the water is low, and by relying on my stepping stone skills, I'd be able to stay out of the water. 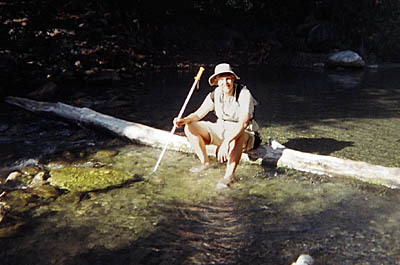 But once I resigned to the reality that I'd have to get wet, stream crossings were fun, fast, and safe. By the way, a walking stick is a real help with the water crossings. Season: Jerry Schad rates it as October through June. John Robinson lists it as November through June. I did it in mid September on a hot day. It was warm but not bad. 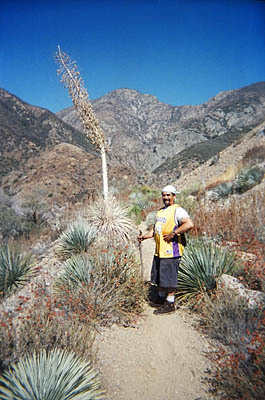 The spring beauty of blooming flowers and green hillsides would add a nice touch to the hike. Talking with those who have hiked the trail in different seasons, they say that the difference in water lever is negligible, except of course immediately after a heavy rain. People traffic: 9-13-03 - had expected huge crowds but was pleasantly surprised that it wasn't too bad. I estimate that we encountered about 66 people in 18 parities (with a group of 20 and a group of 15), When that is spread out over 10 miles and 11 hours, it really didn't have a feel of high density. I know that bungee jumping company takes groups out on Saturdays, so I was expecting to have a crowd of them at the bridge, but they were not out on that day. Animals: 9-13-03 - We saw a garter snakeand 2 tarantulas. A group of 20 saw a herd of bighorn sheep and a lone female bighorn, and a young couple saw a lone bighorn. Permits: A National Forest Adventure Pass is required for parking. 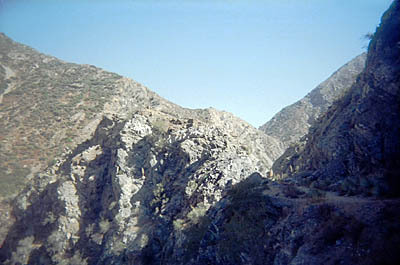 The entire hike is within the Sheep Mountain Wilderness. 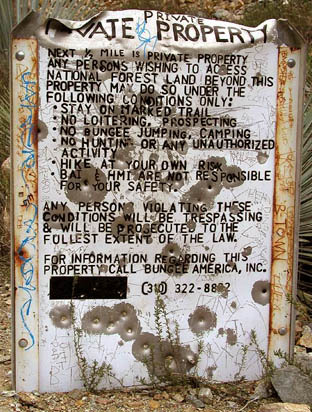 A wilderness permit is required to enter the wilderness. For more information call the ANF San Gabriel River Ranger District at 626-335-1251 or the National Forest entry station at the mouth of the San Gabriel Canyon on Hwy 39 in Azusa at 626-969-1012. Mileage: John Robinson: 9 miles round trip to the bridge and back. Jerry Schad: 9.6. Tom Harrison Map: 9.4. I lean toward Schad. And with the extra walk further up trail to the Narrows, I place our hike at 10 miles round trip. There is a 4-mile maker before the bridge (maybe 6 or 7 tenths of a mile) and a 5-mile marker past the bridge (maybe 3 or 4 tenths of a mile). Elevations: Robinson, Schad, and LocalHikes.com all put the elevation gain and loss at 1000'. 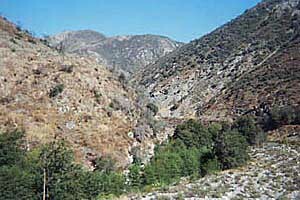 However, the Tom Harrison mapAngeles High Country Trail Map, shows the trailhead elevation at 2020' and the Bridge at 2770, a difference of 750'. Schad's map shows the trailhead at 2000' and the Bridge at 2800, a difference of 800'. There is no roller-coaster action on the trailit simply ascends graduallyexpect for a gentle descent from the trailhead to Heaton Flats campground. The distance from the bridge to the water below is 120'breathtaking when looking over the railing. LDPhotography.net - Bridge to Nowhere - by Lonnie De Cloedt (asa Thomas Canty). 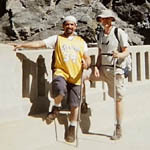 Nice photo album with captions and topo map of his hike on January 23, 2003. Interesting to contrast these winter photos (leafless alders and green grass) with summer photos (green trees and brown grass). This page was last updated July 1, 2009.